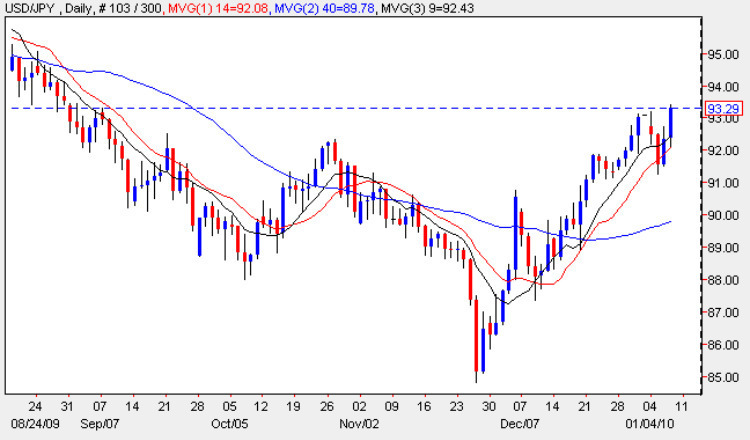 The yen to dollar currency pair continued its strong recovery once again today, ending the trading session with a wide spread up candle which found strong support technically from both the 9 and 14 day moving averages, suggesting that this move is not running out of steam just yet. Whilst the technical indicators provide support to the currency pair, so does the new Japanese finance minister who is doing his bit for the Japanese yen, suggesting that a weak currency is favourable and that he would work with the BOJ to “guide” the currency in the right direction, in which case there is only one way to trade the yen to dollar at present! Technically we have now broken well clear of the potential resistance at the 92 price point, which now offers good support and a platform for the inevitable move higher as US dollar strength combined with ‘enforced’ yen weakness should see the pair surge higher tomorrow, and also in the medium term. From the last few weeks two things are crystal clear. First that 85 is the pain threshold for the Bank of Japan, and secondly that the new minister is determined to make his mark on currency markets and therefore it would be churlish of us to ignore his invitation! What is one of the best retail forex trading platforms? In my view it’s Metatrader 4. Advanced, powerful & intuitive it now comes with ECN execution, so you can happily scalp away without broker or dealer intervention. Just download your free demo copy of MT4 by following this link – download metatrader free – and get started today. Don’t forget to follow my daily posts for updates and analysis of the forex markets to help you with your forex trading – so good luck and good trading.